NMR focuses very heavily in the work that we do. NMR procedures are under development which are being applied for structural analysis of wood and chemically modified wood biopolymers. These involve dissolution of the materials into ionic liquid electrolytes followed by direct NMR analysis on the solutions or derivatisation as typically esters and and analysis of the dissolved or regenerated esters. The first is well documented in a recent article (DOI: 10.1002/cssc.201501511) were we have dissolved even bacterial cellulose (high molecular weight) and managed to obtain a crude HSQC (Heteronuclear Single Quantum Correlation) NMR spectrum. 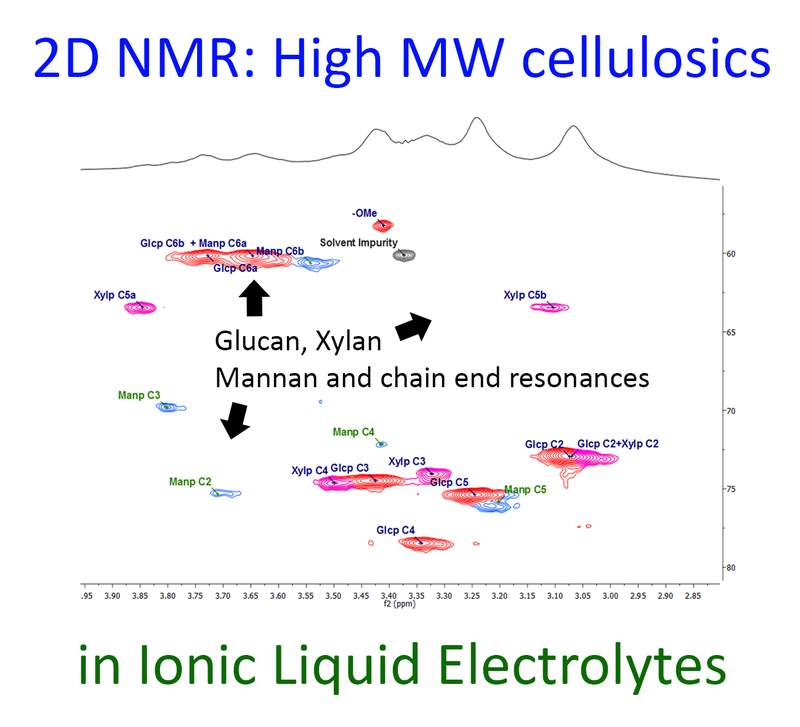 The technique allows for identification of residual hemicelluloses and even the reducing ends in polysaccharides by direct dissolution into the ionic liquid electrolyte, [P8881][OAc]/DMSO-d6 and NMR analysis (Figure). For production of materials, chemicals and fuels, woody biomass typically requires a treatment method to reduce its ‘recalcitrance’. Defining what the ‘recalcitrance’ of biomass is one objective of my research. Our recent article in Green Chemistry (DOI: 10.1039/C3GC41273C) discusses this topic, particularly in relation to the dissolution of wood into direct-dissolution (non-derivatising) solvents. Recent work has shown that wood is actually not soluble in direct-dissolution solvents, without some method of chemical or mechanical pre-treatment (Fig). Fig. NMR procedure for assessing solubility of wood samples, milled with increasing intensity, in common ionic liquids, electrolytes and molecular solvents. 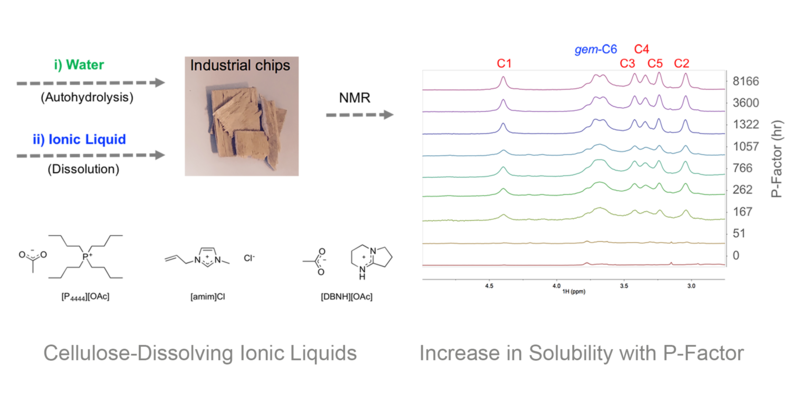 This is the starting point for defining new processes for homogenisation of wood in powerful direct-dissolution solvents, such as ionic liquids. Fundamentally, lignin-carbohydrate complexes (LCCs) are implcated in the recalcitrance of biomass, and not only the crystallinity of cellulose and ultrastructure of the wood itself. The difficulty is that there is no convincing direct evicence of the occurance of LCCs in native wood. Most reports showing the presence of LCCs use harsh treatments (e.g. ball milling) to degrade the material to render to a state where LCCs can be observed. This is the Schrödingers cat of wood chemistry. By direct action of chemicals or mechanical treatments, LCCs may be created or destroyed. Currently the only technique that will give any significant resolution for the identification of LCC linkages is solution-state NMR. However, wood is not soluble in solvents without mechanical or chemical pre-treatments. Recently we demonstrated that the solubility of even wood chips can be increased drastically by application of mild autohydrolysis. Fig. Application of mild autohydrolysis to aid in solubilisation of wood chips.